Visiting the Inner Canyon at Grand Canyon National Park offers many adventures, from the most difficult of rapids on the Colorado River to hiking trails taking you to incredible sights. What can I see and do at the Inner Canyon? 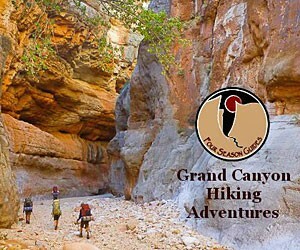 Hiking: Hiking into the inner canyon is an exciting and challenging way to see the bottom of the Grand Canyon. There are a number of trails that lead to the bottom from the rims, both North and South, including the South Kaibab Trail, the North Kaibab Trail, Bright Angel Trail, Hermit Trail and Bass Trail. Camping: Camping in one of the backcountry campgrounds can be a wonderful experience. Stay at the Bright Angel Campground or Cottonwood Camp or find your own spot. You’ll need a backcountry permit if you will be staying anywhere but at Phantom Ranch overnight. Phantom Ranch: Stay at rustic Phantom Ranch and make your hike to the bottom of the canyon as light as possible. At the ranch you can get meals, and you’ll also have plenty of water and all the facilities you need. 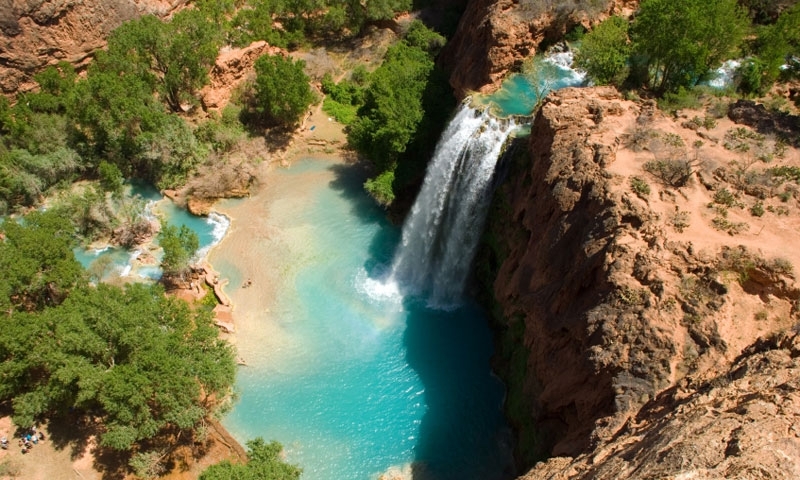 Havasu Falls Canyon: At the western end of the canyon, you will treasure your hike to Havasu Falls Canyon and your visit with the people of the blue-green waters. These Native Americans have lived in this area for centuries. Vulcans Throne: This volcanic feature is on the North Rim, a fabulous testimonial to the wild battles raging between land and lava millions of years ago. These volcano cones fed burning rock into the canyon. Crystal Rapid: Here you’ll find some adventure as you navigate the Crystal Rapid, with its large holes and rock garden beneath the river. This rapid is rated a 7 to 10. Granite Gorge: This gorge runs through Grand Canyon on its way to Lake Mead. Many of the canyon’s most difficult rapids are in this section of the river through Granite Gorge. Granite Narrows: Granite Narrows is a stretch of the narrowest section of the Colorado River. It’s only about 76 feet wide, moving quickly through the canyon walls towering on either side. Hance Rapids: These Class 7 to 8 rapids on the Colorado River offer powerful hydraulics as well as some incredible scenery. You’ll come upon this rapid at mile 76.6. Lava Falls: Lava Falls in Grand Canyon is rated as a Class 10 and one of the most difficult rapids you’ll travel on the Colorado River. You can hear the rapids before you see them, and get yourself prepared for the ride of a lifetime. Lees Ferry: Stop here to do some sightseeing before launching your raft for a trip down the Colorado River. There are a couple historic sites to enjoy, and some great fishing and hiking, too. Pumpkin Spring: When you are rafting down the Colorado River, you will spot what looks like a giant pumpkin sticking out from the canyon wall. The sides of Pumpkin Spring are orange and striped from the mineral-laden water leaking over the edge. Redwall Canyon Cavern: Redwall Canyon Cavern is a large cave in the canyon wall, said to hold up to 50,000 people. You can walk around inside and witness where fossils have been trapped within the formations and walls. Ten Mile Rock: Marking the 10-mile point of your rafting trip down the river, a huge rock stands. This towering landmark was carved by the Colorado as it flows to Lake Mead. Triumphal Arch: Catch a glimpse of what nature can create in the sandstone cliffs above the Colorado River in Grand Canyon. This arch shows how forces of nature can make a thing of beauty. Where is the Inner Canyon? The inner canyon lies at the bottom of the Grand Canyon. 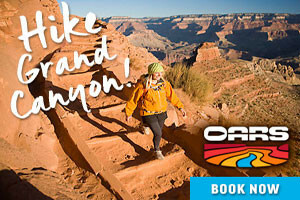 You can experience the inner canyon by hiking the various trails from the rim or by rafting down the Colorado River from Lees Ferry to Lake Mead. Call the Grand Canyon National Park information line with any further questions at (928) 638-7888.